I always thought that the Vulcan sequence at the beginning of ST:TMP was interesting. I wondered why Spock was so determined to shed his human half, what had made him so repulsed by it? We may never know, although when Spock comes to understand V’Ger, he begins to appreciate his human half more (who could forget his hand holding with Kirk? Other interesting aspects of Spock’s failed Kolinahr ceremony to me were that gigantic red food, which I presume was a statue of a prominent Vulcan (I’m sure there are more readers here who know about it than I) And of course, Spock’s long hair! 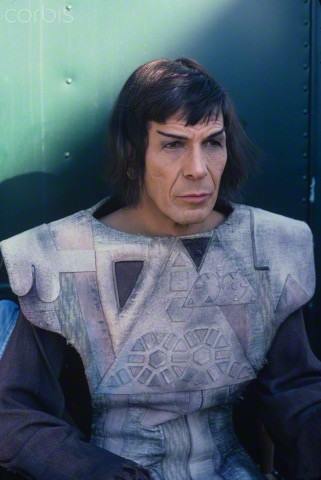 You rock that Prince Valiant haircut, Mr. Vulcan! I always thought his robe here was a bit too quarterback-ish, but it became the standard look for high-position Vulcans to come in all the later series. 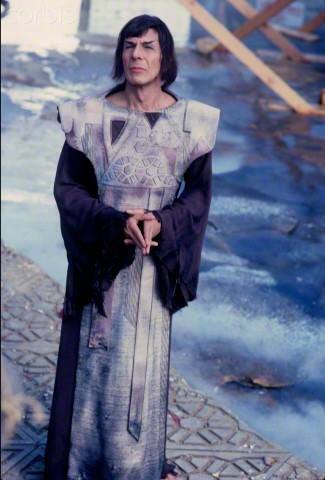 I preferred the original Ambassador Sarek look myself! This entry was posted in My Weekly Spock and tagged auction, emotion, Kohlinar, long hair, robe, Spock, ST:TMP, Vulcan. Bookmark the permalink.